Can a Caffeine Buzz Improve Driving Safety? People love coffee. Along with keeping us honest and making it easier to get going in the morning, research is finding another caffeine-fueled perk: It may play a role in improving driving safety. Fatigue is a major factor in road accidents, accounting for at least 25% of fatal accidents on Australian roads and over 800 road deaths in the US in 2014. In a recent study conducted by the Australian Department of Defense, a team of psychological scientists led by Kayla Johnson (Defence Science and Technology) and Eugene Aidman (University of Sydney) found that moderate doses of caffeine significantly improved driving performance in sleep-deprived individuals – even after 40 straight hours of wakefulness. Participants in the study were kept awake for 50 hours while they completed a series of test drives using a driving simulator. Half of the participants were given caffeine at regular intervals, while the other half were given a placebo. The study, conducted over four days at the Centre for Sleep Research at the University of South Australia, employed a rigorous double-blind, placebo-controlled design. Participants were initially screened for tobacco, drugs, medications, and potential illnesses, through both self-report and blood chemistry analysis. The week prior to the study, participants were instructed to abstain from caffeine and alcohol altogether, and their sleep schedules were verified through both actigraphy and sleep diaries. To ensure a predictable absorption of caffeine, participants were given mint-flavored Military Energy Gum containing a 200 mg of caffeine – about the same amount as a strong cup of coffee. Those in the placebo group received gum that was identical in taste and texture, but caffeine-free. Gum was distributed every two hours in the early morning, for a total of four servings of 200 mg of caffeine (the equivalent to four cups of coffee). Every three hours throughout the experiment, participants completed an easy 40-minute driving scenario. Each of the 15 identical scenarios involved driving along a rural highway at 80 km/h, with no other cars, obstacles, or intersections. Driving performance was assessed by staying in the correct lane, speed, and crashes. If the driver “crashed” during the drive, the car was reset to the middle of the road. In between driving sessions, participants could hang out in a lounge room where they could watch movies, talk, or play games – but they weren’t allowed to sleep. After staying awake for 50 solid hours, participants were provided with a 9-hour recovery sleep before leaving the lab. As expected, after 48 hours without sleep, driving performance began to decline for all participants. But drivers in the placebo group began to show the dangerous signs of drowsy driving far earlier than individuals who had consumed caffeine. “In the caffeine group, speed variability, lane deviations, and catastrophic lane deviations were all signiﬁcantly lower than in the placebo group at any time after 19 hours of wakefulness,” Johnson and colleagues write. Drivers in the placebo group started to get into crashes after 22 hours, while those in the caffeine group didn’t have a single crash until the 40th hour of the experiment. “Remarkably, the preservation of driving performance in the caffeine group lasted well beyond the time of caffeine administration (0100h to 0700h) and even beyond the expected window of direct effect of active caffeine in the system (approximately 0130h to 0900h),” the researchers explain. However, Johnson and colleagues are careful to caution that driving while drowsy – even with caffeine – is risky and should be avoided. 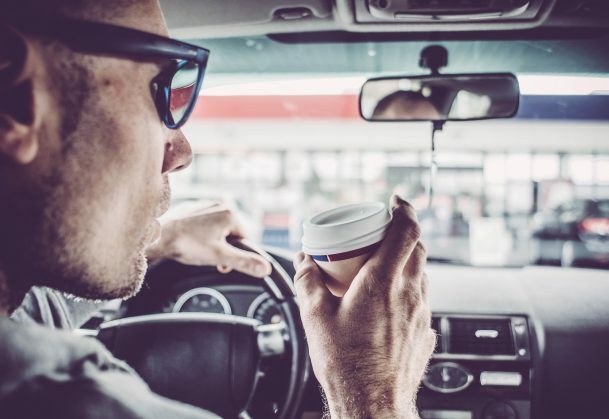 However, in circumstances where there is no other option, such as for soldiers involved in a mission, caffeine may be one way to help keep drivers safe. For her work on this study, Johnson was awarded the Best Young Scientist Award at the International Conference on Traffic and Transport Psychology (ICTTP). Johnson, K., Aidman, E., Paech, G. M., Pajcin, M., Grant, C., LaValle, C., … & Banks, S. (2016). Early morning repeat-dose caffeine mitigates driving performance impairments during 50 hours of sleep deprivation. Road & Transport Research: A Journal of Australian and New Zealand Research and Practice, 25(3). News > Minds on the Road > Can a Caffeine Buzz Improve Driving Safety? That s important to know considering Americans on average drink three cups of coffee daily , most of it in the morning, says the National Coffee Association.